The destroyer “Mogador” under the fire of the British squadron, leaving the harbor, got hit by a 381-mm projectile in the stern. This led to the detonation of depth charges and the destroyer stern tore off almost to the bulkhead of the stern engine room. 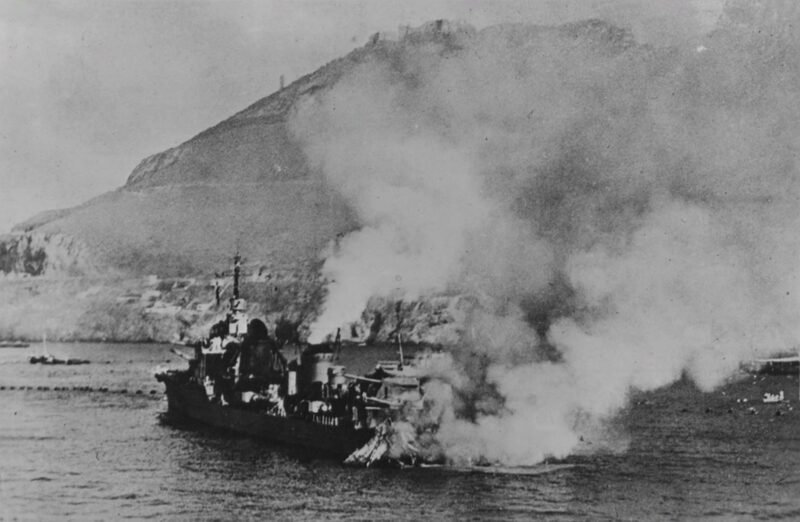 Subsequently, the Mogador destroyer was able to run aground and with the help of small vessels that had approached from Oran began to extinguish the fire. The photograph illustrates an episode from the Operation Catapult by the English Navy. Operation Catapult was aimed at seizing and destroying French ships in British and colonial ports under the pretext of preventing these ships from falling under German control after France’s surrender. The main episode of Operation Catapult was an attack by the British Navy of the French squadron in the port of Mers-el-Kébir on July 3, 1940.